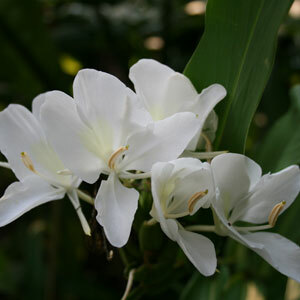 Hedychium Gingers are more cold hardy than most gingers, often call Hardy Ginger Lily. This group of ginger put on a great show of flowers in the summer to early fall, most are very fragrant and smell similar to Lonicera spp. The name White Butterfly comes from the ginger’s many clusters of pure white flowers with yellow throats. Hedychium coronarium blooms can be seen from July through October. This wonderful hardy ginger has medium green foliage and grows up to six feet tall.